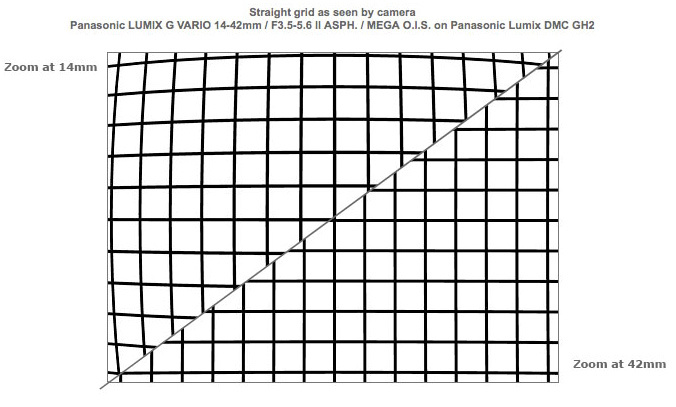 The Panasonic Lumix G VARIO 14-42 f3.5-5.6 II Asph. Mega OIS has a very long name, for a fairly small lens. With a Micro 4:3 mount, it will fit on cameras from both Panasonic, its Lumix G range, and Olympus, its Pen range and the OM-D. This 14-42 is the second model covering this zoom range, both also having the same aperture range. The design of this new version consists of 9 elements arranged in 8 groups, two of the elements being aspherical. At the wide end of the zoom range the lens has an aperture of f/3.5 and closes down to f/5.6 at the telephoto end. The 3x zoom ratio covers the ‘Standard’ range, making this an ideal general purpose lens. 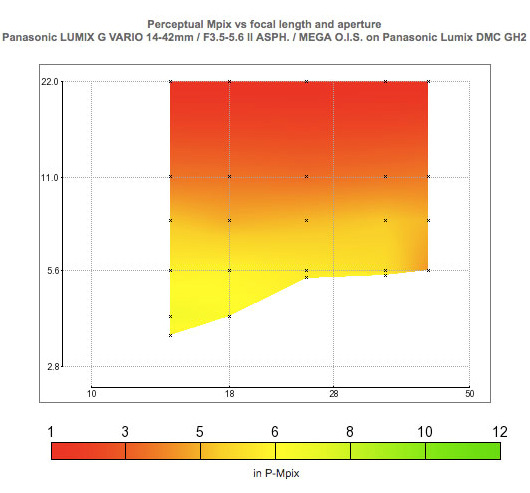 Optical Stabilization is incorporated in the form of Panasonics’ Mega O.I.S. Measuring 49mm long and 56mm wide and weighing in at 110g the lens is not super compact, but should be quite comfortable to hold and use. Focus is down to 0.2m giving a maximum magnification of 0.17x. The Micro 4:3 format has a focal length multiplier of 2x to get the relative full frame focal length so this lens works out to an equivalent of 28-84mm. 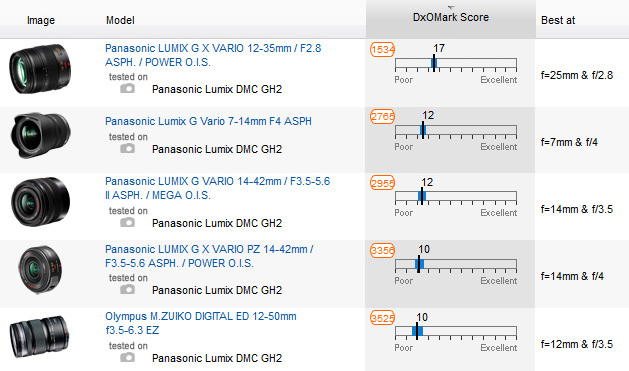 The scores achieved by Micro 4:3 lenses are, as a whole, not very high, so this score is relatively good: the second highest zoom lens tested by DxOMark on the Lumix DMC GH2. The variations in the results from wide angle to tele for Distortion are quite pronounced, with very good correction at the long end of the scale, but noticeable barrel distortion when used at 14mm. 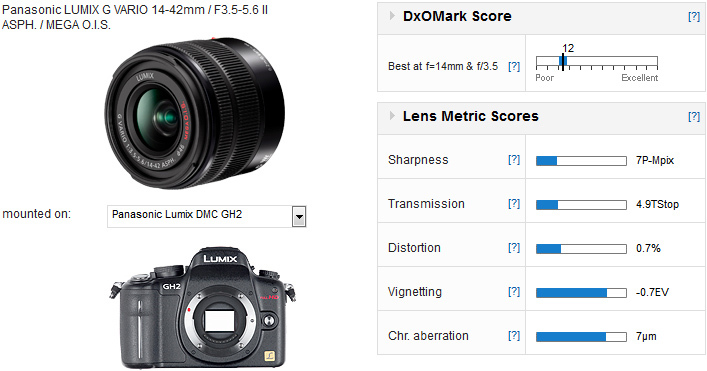 This is no real surprise, as other zoom lenses in this category perform similarly. The difference between the distortion at 14mm and 42mm is quite extreme. 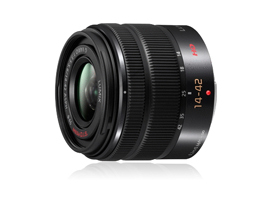 In common with other lenses for cameras with quite small sensors, the 14-42mm is not able to deliver when it is stopped down. The sharpness score of 7P-Mpix is achieved with the aperture wide open: f/3.5 at 14mm. At f/8, throughout the zoom range the sharpness has dropped to around 5P-Mpix. The lack of sharpness is probably due to diffraction, but it is a pity that so much of the possible range of settings will produce relatively poor resolution. This is quite an interesting comparison in that the basic specification of focal length and aperture are identical. The PZ version has a Power Zoom and the O.I.S is ‘Power’ too: Panasonic states that the Power O.I.S is twice as efficient as Mega O.I.S. These extra features make the PZ version more expensive, and you might expect that it would perform better too. It is the cheaper version that takes the prize for quality, however. 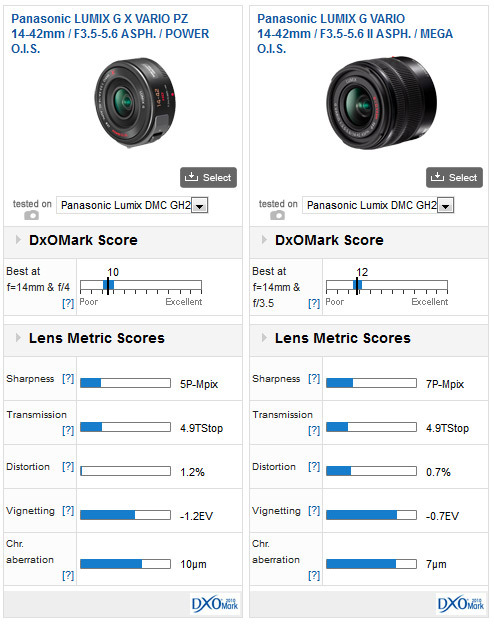 The DxOMark Overall score for the PZ version is 10 against 12 and Sharpness, Distortion, Vignetting and Chromatic Aberration all favor the cheaper lens. Unless you need the Power Zoom the choice should be easy. 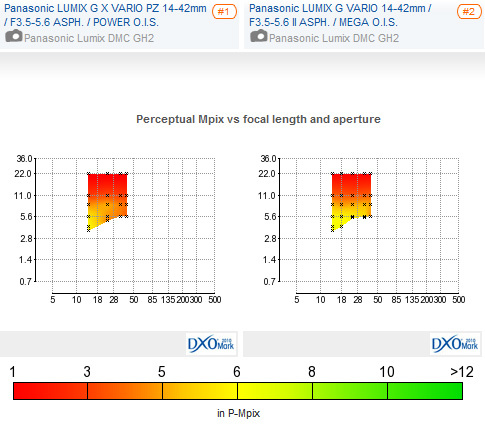 There are alternatives: Panasonic’s Lumix G X VARIO 12-35, f/2.8 Asph. Power O.I.S that we reviewed recently is certainly better, but it is much more expensive. Nearly all of the advantage that the 12-35mm has is achieved with the aperture fully open so it is not a perfect comparison, since the 14-42mm can’t go there, but if you can afford the extra, then the 12-35 is a superior lens. Olympus has an offering that is close in specification too, the M.ZUIKO DIGITAL ED 12-50mm f3.5-6.3 EZ. 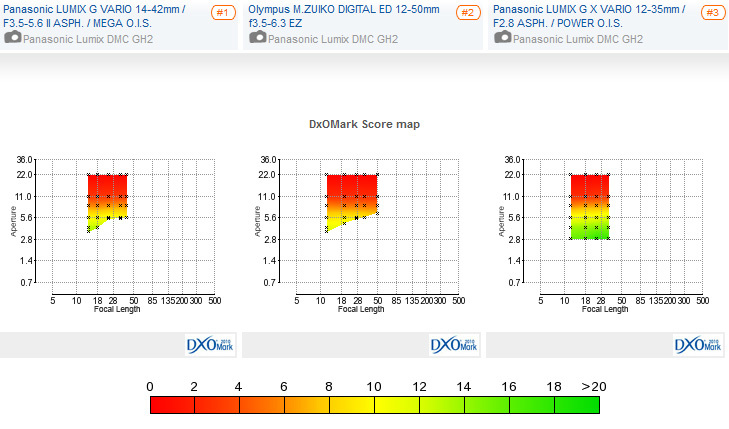 It is nice to have the slightly longer zoom range but the Olympus lens scores lower than the Panasonic, achieving a sharpness score of just 4 P-Mpix – it is also more expensive. 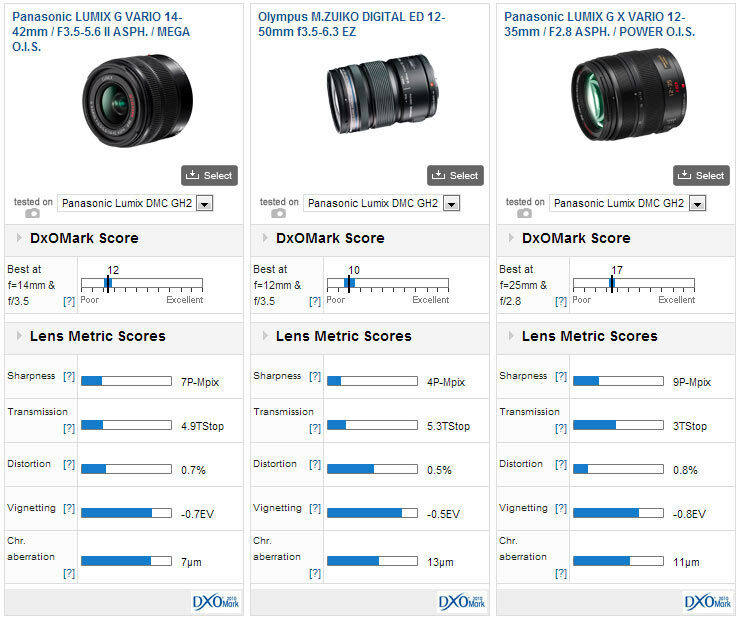 Olympus certainly make the best prime lenses for Micro 4:3, with 4 of the top 5 of all lenses being Olympus, but for Zoom optics Panasonic has the same dominance, with 4 out of the top 5 zoom lenses coming from them. Micro 4:3 is a very elegant concept: compact, making good use of the technology, not having to accommodate a reflex mirror and so on. However, the best optics available are not really outstanding. This Panasonic 14-42mm zoom lens stands up very well against the alternatives, especially in view of its relatively low price, but it is still possible to buy better equipment in other formats for less.